The elections to the European Parliament in May 2019 are coming closer and closer and also the antifascist associations are called upon to make their contribution to the political debate and against the advance of extremely right-wing and right-wing populist parties and groups in this election campaign. The executive committee of the FIR wrote to it a common « Call of FIR », which describes our content wise position to Europe and the goals of our intervention. The member federations can take over this call or extend it with their national topics. 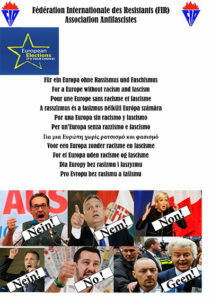 As assistance for the public appearance of the FIR and its member federations in these arguments, we have prepared a poster and small flyers on which our common slogan is printed: « For a Europe without racism and fascism » in different languages. At the head of the poster you find the logo of the FIR and – if you want – the logo of the respective member organization or partners. The office of the FIR can prepare for each member federation a suitable master copy (A2 or A3) as pdf format, which can be printed in your countries. Please let us know as soon as possible if you are interested.